Here I am on a floating dock, but standing tall. It’s the perfect metaphor for where I am in my gastric sleeve journey. While I’m not sure where the water is going to move me while I’m on the dock, I’m still standing firm. I am happy that I am confident where I am in life, but I know it’s OK to change direction and seek help no matter what! I looked at this particular photograph the other day and realized it was the perfect metaphor for how I am feeling these days: standing strong in the midst of uncertain waters. For the past few months, I’ve felt out of sorts and I couldn’t quite figure out why. Oh, I could say that say that the move to new state and all the changes that come along with it is the cause for my fatigue and stagnant physical and mental health. Even with trying new exercises, going to bed early and eating better, I just seem to be coasting along on my continuing journey to being the healthiest “me” I can be. Even though I’m standing tall and living my life happily, something kept nagging at me, that perhaps all wasn’t right. Falling into bed exhausted at 9 PM wasn’t typical for me, a former night owl. I cut out all the sweets from the holidays and still felt hungry and in need of caffeine constantly. I kept trying to improve at my swim class, but I was still tired after each class. Finally, I decided to do something about my health. While I’m almost four years out from gastric sleeve surgery, I reminded myself that my journey isn’t a straight line. I am always looking to improve and sometimes you need help when the improvements you make on your own aren’t working. There is no shame in admitting you need help, whether it’s with physical or mental health. It was time to look for help. Since we’ve moved to a new state, I needed a new doctor. I picked a naturopathic doctor. I wanted to get a new perspective on my health and while it might seem contradictory, I want the least about of medical intervention in my life. Going off high blood pressure medicine was one of my favorite successes with my weight loss, so I would like to improve my health as naturally as possible. Trust me, I’ll all for medicine when necessary, but if I can be better through proper eating and exercise, I prefer that method! My new doctor looked at my June 2016 blood work in shock. She couldn’t believe I was functioning with such low iron levels. I told her my previous doctors didn’t seem too concerned but I could tell she was. And when the new blood work came back in, my fatigue all made sense. My iron is extremely low and might be the cause of other symptoms I have like itchy skin. I’m on iron supplements in hopes it will bring my levels up, otherwise I need to do an IV infusion. Between my supplements and improved diet, I hope to avoid the IV, but I will do what is necessary to for my health. Besides the regular blood work, we did a food sensitivity test since that could also a reason for my low iron absorption, although gastric sleeve patients can have vitamin and mineral absorption issues as a result of surgery. The look of horror on my face when I read the results must have been Oscar-worthy. It said high sensitivity to wheat, dairy, sugar, and coffee. Yes, I said coffee. Losing wheat and dairy from my diet wasn’t as horrifying as the thought of coffee and sugar. No, I didn’t run from the doctor’s office. Instead I went to see a nutritionist to work on a month-long elimination diet. I will eliminate the foods that show I have a high sensitivity for a month and then slowly add them back to see how I react. I’m not starting it until after my birthday on March 8th, but I’ll keep you posted. Or perhaps you’ll just hear a crazed woman calling out for coffee and know that it’s me. OK, yes, I’m nervous about this diet, but with the help of my nutritionist I feel like I can do it for a month. Really, I barely ate anything for the first month after my gastric sleeve surgery, so I know I will survive. Her suggestions of new meals that included bacon are encouraging. Really, as long as I have bacon I’ll be OK. And I have a list of coffee substitutes to try so I might just get through it without sobbing every time I pass Starbucks. So, I have a plan to improve my nutrition, but what about improving my exercise routine? While the swimming class I’m doing is challenging and different, my first exercise love is running. It’s the perfect activity for me physically since I can do it indoors or outdoors. Mentally, I love it because I can do it alone with just my music, or I can run with a friend. And while I’ve been running for over four years now, I just can’t improve my time. No, running isn’t all about pace and distance, but I feel like I’m just not going anywhere with it, so to speak. Every day I am thankful to my ever-supportive husband who knows just when to encourage me out of my comfort zone. While the whole family met with a trainer at our new YMCA, the hubby asked about running trainer for me. Forget candy and flowers, this woman is happier to have a trainer! My first training session was last week and it was encouraging and humbling. We did some tests and exercises to see where I am in my physical fitness. I’ve come along way since my pre-weight loss days! But when I stumbled during the session, it was a good reminder that there is always room for improvement. And this is the main reason I am working with a trainer: to improve what is already working. I exercise more than I have in my life, but I’d like to be more efficient. I’ve researched fitness online and through books and magazines, but having an expert work with you one on one can’t be beat. You can’t hide in the back of an exercise class when it’s just you and your trainer. This is getting me out of my running comfort zone. Now, I don’t want to make it sound like I’m unhappy with where I’m in my weight loss journey. I spent too many years thinking that “life would get better once I (insert any goal here)” and I know that’s not true. I am proud and ecstatic with the success I’ve made in becoming a healthier and happier person. What I didn’t know before I began this journey was that there isn’t an ending to it. Sure, I might reach my goal weight, eat healthy every day, and run races, but those are just milestones along the way. There will be times that I need to adjust what is working and there will be times I need help from professionals. And I will always need help and encouragement of my family and friends. Thank you for supporting me here at Down the Scale while I continue to stand tall in the midst of ever-changing waters of health and happiness. 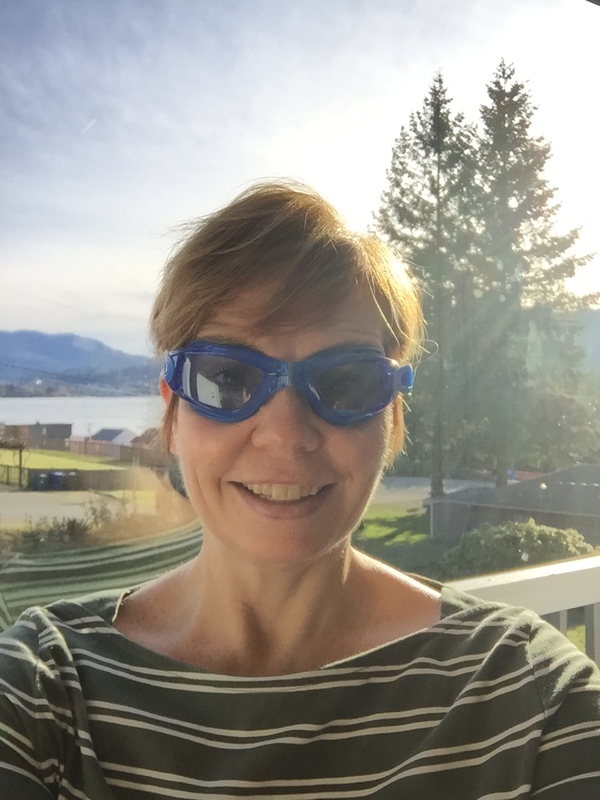 Goggles are making it easier to get over my fear of putting my face in the water. My weight loss journey continues with new physical and mental challenges! This was the first promise my friend, S., and I made when we decided to join the pre-masters swim class at our local YMCA. It’s a class for adults who want to improve their swimming techniques along with getting a good workout. She and I were both looking for a challenge to our regular workout routine for the new year. *I have no recognizable swimming style. I never took swimming lessons and I’ve pretty much learned to swim by watching others. I can swim enough to be comfortable in the water, but I always feel like I’m splashing about. I don’t know how to breathe properly when swimming so I stay above the water as much as possible. *I’m scared of putting my face in the water. I’ve used the excuse that I wear contacts so I don’t want to go under water, but really I am scared. As I child I got caught in some rough waves at the beach and it took a number of turns around the ocean to finally get out. And while my brain knows I won’t drown in the pool and that I’m perfectly safe, the rest of me isn’t buying it. *Swimming involves more prep work and wearing a bathing suit…I hate it! Actually, I’m OK with wearing a suit even though I’m feeling lumpy and bumpy these days. Swim class isn’t a fashion show and really, no one cares who wears what or how your body looks. I just hate having to switch into a suit and either shower at the Y or rush home to shower. Running is all about putting on your running shoes and going! Not much preparation there! *I need to make myself uncomfortable. I blogged about pushing myself out of my comfort zone last September and I find that I still need to do it. To keep myself motivated and interested, and yes, to help with weight loss, I need to challenge myself whether it’s my exercise or eating routines. 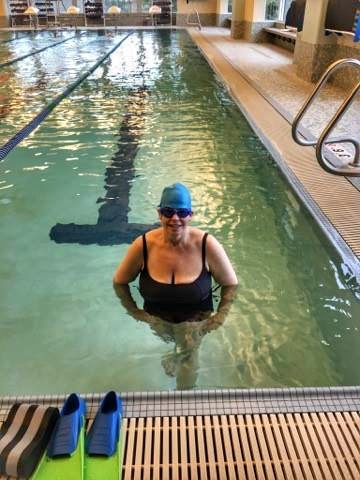 This swim class makes me try something I haven’t done so far in my weight loss journey. *I feel great afterward! Yes, I hate the prep and clean up after class, but my body feels good. Oh, I’m sore since this is a full body work out, but it’s a good kind of sore. I also feel empowered. While I’m not a great swimmer, I complete the class! And no, I haven’t drowned yet! I’m even putting my face in the water more and more each time. Who knows how far I’ll go to improve my swimming technique, but I do know that I’m doing something great for my body and mind. *Exercising with other people is fun and encouraging! Being accountable to another person is a great way to keep up with an exercise program. I’m thankful to have my friend, S., meet me at class. But even when one of us can’t make it, the other person goes to class and let’s the other know what the drills were that day. For me, I like the instructor and the other swimmers. Our instructor is well aware of my underwater phobia so she encourages me to keep trying, but never guilts me into doing more than I’m comfortable with. And the other swimmers are great! When you swim with women 20 years older than you, you are inspired! It reminds me of one of the many reasons why I started my weight loss journey: to be healthy as I grow older. Yes, it’s humbling to have older people swim better and faster than you, but I use it as inspiration, not negativity. Proof that I am actually going in the pool! And yes, I’m in a bathing suit! Be comfortable with your body..it’s the best gift you’ll give yourself!